Introduction/Background: Parkinson’s disease is a neurodegenerative disorder that affects movement. It evolves slowly, usually starting as either stiffness in a hand or a small tremor. Over time, Parkinson’s progresses; typically characterized by motor symptoms such as slowness of movement (bradykinesia) with rigidity, resting tremor (Parkinsonian tremor), balance and walking problems, and difficulty swallowing and talking. Parkinson’s has several non-motor symptoms including anxiety, depression, insomnia and psychosis (just to mention a few). ~60,000 new cases of Parkinson’s disease are diagnosed each year in the United States, adding to the greater than one million people who currently have Parkinson’s. It has been estimated that 7-10 million people worldwide are living with Parkinson’s. 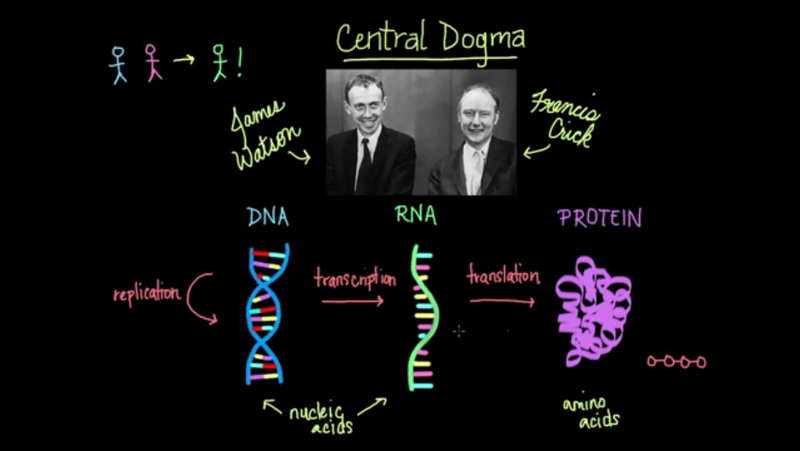 What is the “Central Dogma of Life”? (click here) The process of how the information and instructions found in DNA to become a functional protein is termed the ‘Central Dogma’. The concept of the central dogma was first proposed in 1958 by Francis Crick, one of the discoverers of the structure of DNA. The central dogma states that the pattern of information that occurs most frequently in our cells is as follows: (i) use existing DNA to make new DNA (replication); (ii) next, from DNA to make new RNA (transcription); and (iii) finally, using RNA to synthesize new protein (translation). The drawing below depicts the central dogma (the drawing is from this video, click here). 23andMe: What does the name 23andMe represent? Our genetic material (genes) are housed in chromosomes and they are composed of DNA. We have 23 pairs of chromosomes in each cell capable of producing new proteins; thus, the name of the company makes sense. 23andMe provides DNA testing services. The information derived from studying your DNA and genetic make-up can provide information about your ancestry, your genetic predisposition to many different diseases, drug responses and inherited conditions. There’s an old saying that goes “Mother is always right.”: My mother said for her entire life that we were English, Scottish (or Irish), French and German in our ancestral ‘gene pool’. Several years ago, my extended family and I took to spitting into the 23andMe test-tubes. We mailed them back to the company to establish our genetic history and screen our family gene pool for several diseases and their inherited susceptibility. Guess what? Mom was absolutely right about our family ancestry. Interestingly, there was no evidence of early onset Parkinson’s in my extended family; thus, my disorder is the sporadic/idiopathic type of Parkinson’s. The 23andMe Parkinson’s research study: A few years ago, 23andMe decided to better understand the genetics of Parkinson’s disease; thus, the Parkinson’s research initiative. Their goal is as follows: to understand the genetic associations found between Parkinson’s patients’ DNA and our disease; to take this new knowledge and search for a cure; and ultimately, they strive to enhance and speed-up how Parkinson’s disease is studied to better understand the genetics of the disease (click here to read further details). It’s easy to get involved in the 23andMe Parkinson’s research study, here are the eligibility requirements: (1) You have been diagnosed with Parkinson’s disease by a qualified physician; (2) You are willing to submit a saliva sample for DNA testing and complete online surveys related to your condition; (3) You have access to the internet; and (4) You are at least 18 years old. The flow-chart below shows all one has to do to join this community of people-with-Parkinson’s helping out to search for a cure. 23andMe has an impressive group of primary research partners and several other organizations as supporting partners, see below. To date, more than 10,000 people have agreed to be in 23andMe’s Parkinson’s Research Community, which makes it the world’s largest collective of genotyped Parkinson’s patients. Furthermore, many thousands of people without Parkinson’s have also consented to participate in these research studies. It’s a personal decision and choice, but it’s also advancing our knowledge of Parkinson’s: If you have concerns, look over the 3 websites cited below. The question is should you volunteer your DNA for the study? Should you consent to have your DNA further sequenced? And the nice thing about being involved is you don’t have to leave your home to participate; it’s an in-house study in that they mail you the tube/device, you spit into it, and mail it back to 23andMe. Simple. Valuable. Straightforward. Elegant. Contributing. Joining the Parkinson’s team. Ponder it, think about it some more, possibly fill out the questionnaire, upload the information, you are now part of the Parkinson’s 23andMe team. Why should you participate? You will be providing your own small piece to the Parkinson’s genetic puzzle; help complete the assembly of the landscape to this amazing puzzle. You will matter whether you participate or not; you will always matter. However, congratulate yourself if you decide to join the team; the 23andMe Parkinson’s research study. You can be part of the unraveling and the delineation of the genetic anomalies that cause Parkinson’s.